It was just like Christmas today! 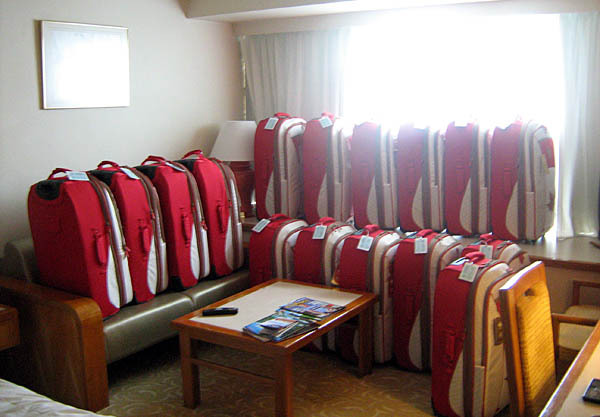 Approx 40 suitcases of clothing was delivered to the Media hotel today (where I’m based) from Beijing containing the official Canadian Olympic Committee clothing. Let me back up for a second…..the suitcases were each in their own box, so 40+ boxes were delivered. So first job was to pull out the boxes for those who are already here and an outfitting session was scheduled in 2 hotel rooms (1 for girls, 1 for guys). The COC arranged for a tailor to come who could do any on-the-spot alterations which worked out quite well. Luckily the clothing sizes worked out for about 80% of everyone. For the other 20%, the COC is supposed to be sending a mixture of sizes on Saturday so hopefully people can swap to the size they need. This is the 2nd outfitting I’ve been through (2007 Pan Ams being the first) and it seems that you kind of hold your breath when you open the bag hoping that the size you asked for is in there. Then the second hope is that the size you asked for actually fits! With the exception of some shorts, I pretty much lucked in with the sizing. what my hotel room looked like once I had all the suitcases out of their boxes. Boy oh boy….I’m starting to get really jealous! I can’t wait until I get there..see you on Friday!! Pictures of the Pants pls. This blog is great Kerri It keeps us all excited for you guys from home!! Thanks so much! What no pictures of these PJ Pants?? Kerri i’m dying to see em :p ROCK ON CANADA!